I started this blog because much like my Father, I liked eating Hamburgers with my friends. 546 Burgers later, that dream is still alive. In fact, because of the blog I have made a lot of new friends who love and appreciate the world’s finest sandwich just as much if not more than I do. Especially the team behind the Food Film Fest. Ever since I was brought into the family to help with “Cheers to Burgers and Beers,” I’ve enjoyed many an awesome venture into the Burgerverse with these Burgerfreaks. 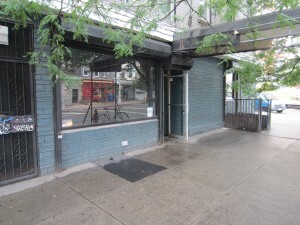 Most recently when a new Burger spot called Blue Collar opened up in Williamsburg, Brooklyn a proposal was made to check it out together. 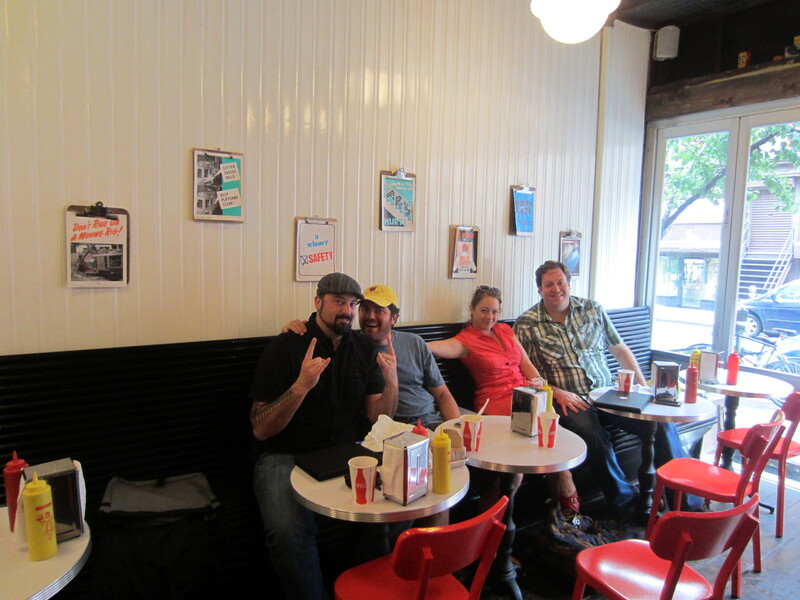 Nothing with this crew is ever done lightly so of course, this turned into a multi-Burger trip when George Motz pointed out that Blue Collar was right down the block from one of his favorite Brooklyn Burgers, The Commodore. An agreement was reached, a date was booked and a bright future in Burgers was on the menu for all of us. Burgers are an artform and nailing down the perfect Burger first starts with choosing a style. 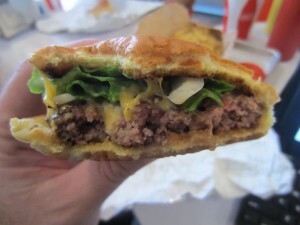 There’s pub style, fast food, slider, gourmet, steakhouse, etc, etc (read more on this great post from A Hamburger Today). As much as this East Coast boy wishes we could claim something, California brings it to the table with the West Coast Style Burger. This is a fast food style Burger made with all fresh ingredients, usually on a White Squishy Bun, Lettuce, Tomato, Onion, American Cheese and some form of Sauce usually based around the concept of Thousand Island Dressing. If you’ve ever eaten at In-N-Out, you get it. 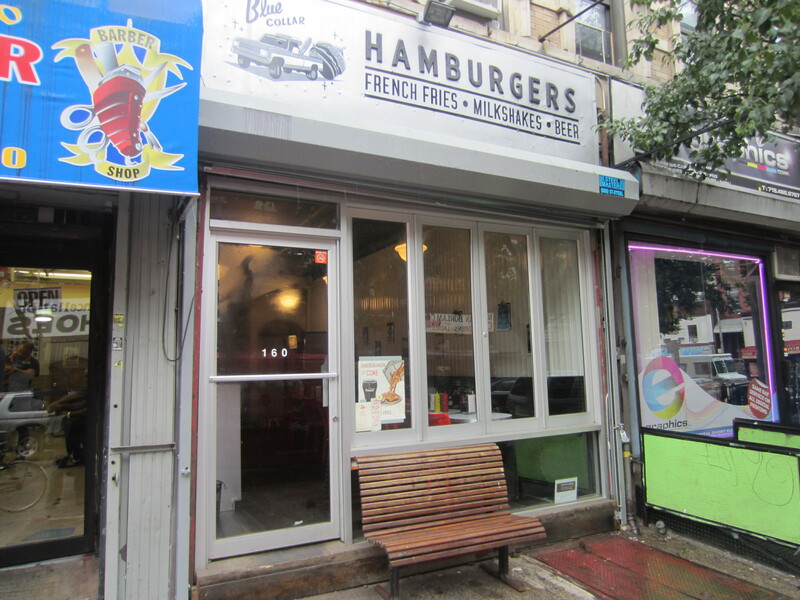 Here in NYC we get a lot of places trying to mimic the style, most notably Danny Meyer’s every growing ShakeShack. Not only is the menu small but so are the prices. 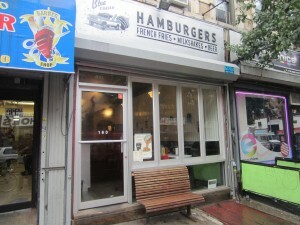 Fresh made quality Burg, Fries & Soda for less than $9.00…in NYC?!?! YUP. 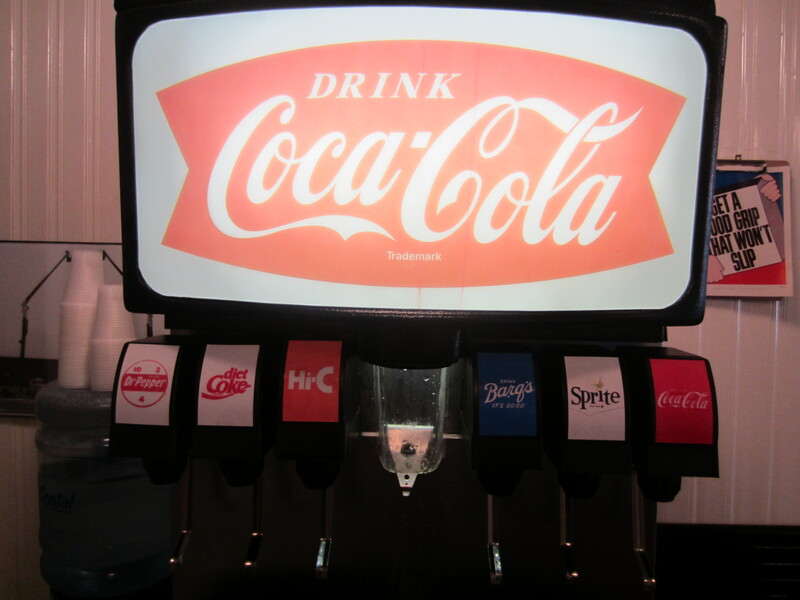 Blue Collar feels right like it’s out of the 80s with these prices and their decor including retro fountain Soda logos, old school Yellow & Red Mustard & Ketchup dispensers, wall decorations and menu. It almost feels like you took a Delorean to get here, if you follow what I am saying. 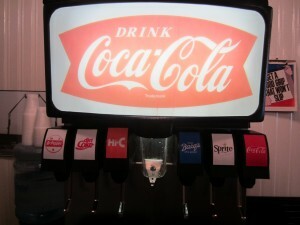 Who remembers Suicide Sodas from the 80s? When at Blue Collar, go for it. I did. The Burger itself is a total crowd pleaser. Seared patty made of fresh never frozen Beef, soft Potato Roll, very green Lettuce, White Onions, Melted Cheese and a tangy dollop of Sauce. 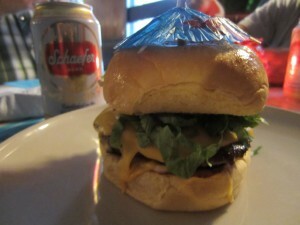 In a world where Chefs are trying to create unique Meat blends, topping Burgers with all sorts of insanity, using crazy cooking methods, charging outrageous prices for the sandwich, it’s great to know that there’s a place like Blue Collar making simple Cheeseburgers that are not only delicious but also affordable. If I lived closer, i’d almost feel guilty not eating here once a week. My father loved to consume two things: Beer & Burgers. Nothing sounded more appealing to my Pops than slugging up at some dive bar, and washing down a tasty Burg with a coldie. Most frequently, you would find him parked up at the Oceans 11 Bar in Hollywood, FL. Probably not a shock that I turned out the way I did, eh? So nearly every time I am eating a Burger with a Beer, I am thinking about my Dad. I’m guessing you may have similar memories of your Dad as do the folks who own the Commodore. If the dictionary had a definition for “old man’s bar” the picture next to it would most certainly be The Commodore in Williamsburg, Brooklyn. “Old man” cans of beer, large booths, a jukebox, cheap bar Food, low-light, no signs outside, padded bar stools .. in fact, this place looks like the bar your Father would build in his basement. But since most of our Mom’s would never allow it, The Commodore exists. But inside that nostalgic, minimal, old-school exterior is something pretty cool and modern. The Commodore serves greenmarket oriented, locavore eats. 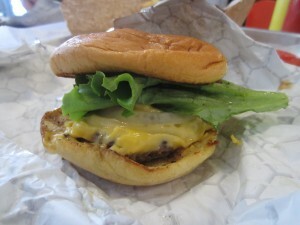 As an example, the Beef in the Burger is sourced from a free-range Angus at an upstate farm. Also, the menu isn’t your standard pub-fare, especially with items like Pork Boats, Sauteed Kale & Mexican Chicken Soup with Hominy. Beyond all of the nifty food choices, there also a couple of local Craft Beers available and a unique and interesting cocktail menu. All of which proves what our Moms taught us when our Dad’s didn’t have us hanging out at the bar, never judge a book (dive bar) by it’s cover! I’ve had quite a number of people suggest I eat the Burger at the Commodore and I’ve read more than my share of positive reviews for the place. Even though I wasn’t that hungry, after eating down the street at Blue Collar, I couldn’t wait to eat this Burger. 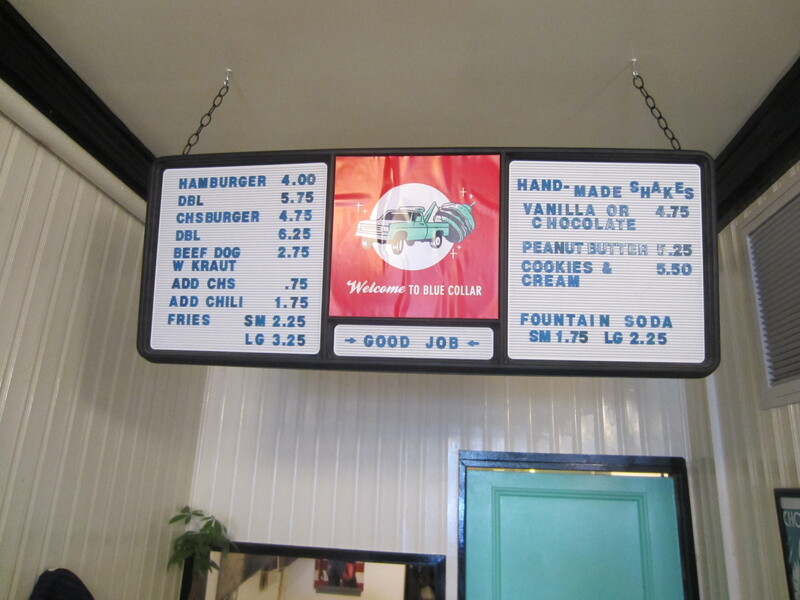 Much like their neighbors, The Commodore Burger is an old-school simple prep, served on a soft Potato Roll with Cheese, Lettuce, Onion, Tomato & Pickle & Mayo (mine ordered sans T & P). 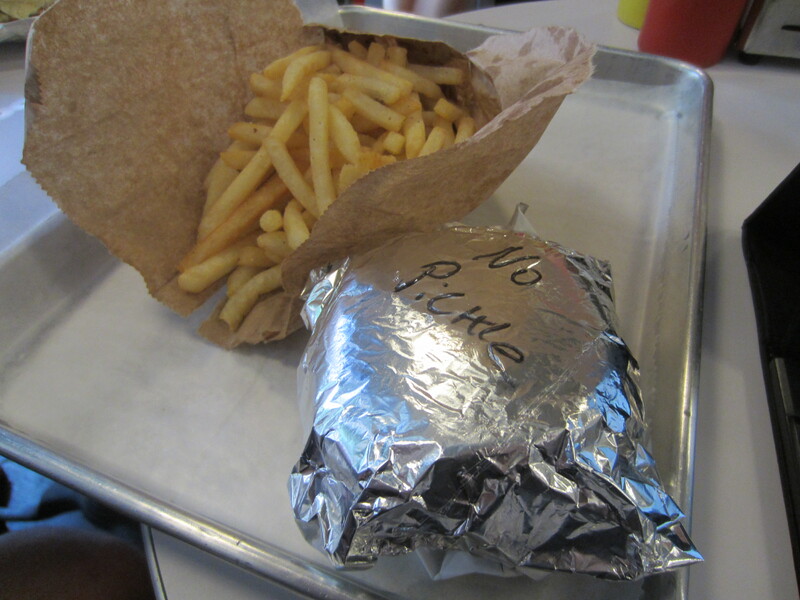 It fits easily into one hand and while pretty damn juicy, doesn’t require utensils or too many napkins. 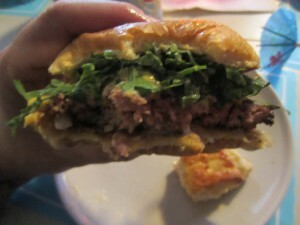 In general I find grassfed Beef to be less savory than grain or cornfed but this Burger was different. Too make up for that flavor difference, The Commodore is adding some spicing to the patty (which honestly could be just the right amount of Salt & Pepper) giving it a very savory taste. It’s sure to not only get your lips smackin’ but also walking up to the bar to get another Beer. Also of note are The Commodore’s Biscuits. I grew up the son of a Southern Momma and we were raised to respect and cherish a properly made Biscuit. 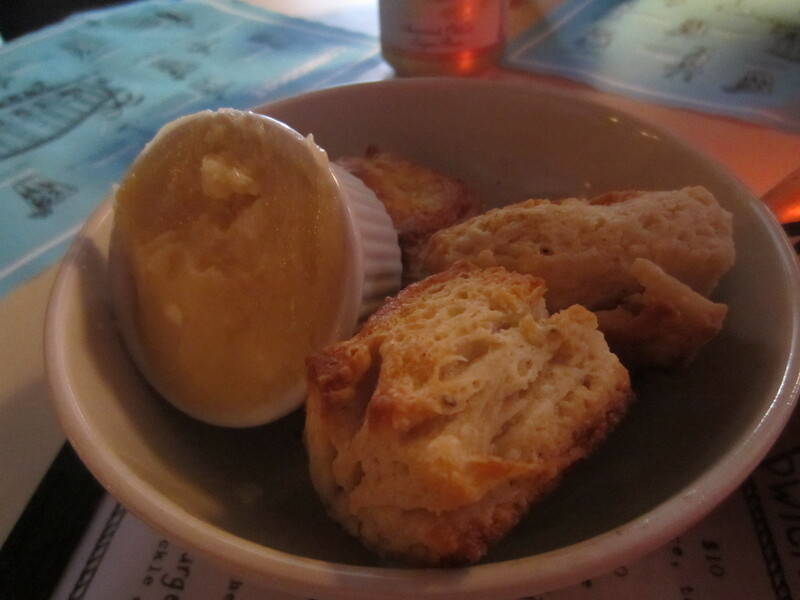 Anyone can make a Biscuit but making it right is an art form. Chef Stephen Tanner NAILED this one! Do not miss out on these sweet and savory, warm and flaky and oh so tasty little fluffy bites dipped in Honey Butter! LOVE BURGERS!?!? Love Burgers!?!?! 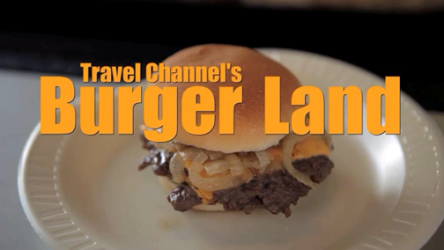 Be sure to check out the premiere of George Motz’s new TV show “BURGER LAND” Sunday, September 2nd at 7 pm on Travel Channel. Blue Collar scores a 3 on The Rev Meter. The Commodore scores a 2 on The Rev Meter. This entry was posted in Bar, Beer, Brooklyn, Burgers, Food Film Festival, Hamburgers, New York and tagged best burger nyc, blue collar, brooklyn, burger conquest, burger land, cheese, ciancio, food film festival, french fries, george motz, hamburger, new york, ny, nyc, rev, review, the commodore, the rev meter for social community, travel channel, tv show, williamsburg. Bookmark the permalink.